I will get to the game momentarily. But first, a little backstory. I grew up on the banks of a river — the Row river (pronounced like “ow”) in Cottage Grove, Oregon. It’s a somewhat lesser-known river in the Willamette valley, but well-known to me and my family. This river left an indelible impression on me that has lasted to this day. My knowledge, connection and love for this river has also changed over time. The Row river is an approximately twenty mile stretch of water in the upper-Columbia basin. From a handful of minute tributaries flowing out of the Cascade Range — Mosby creek, Brice creek, Cedar creek and others — it forms a river of moderate size. This water then joins the Coast Fork Willamette, which drains into the Middle Fork Willamette for a short distance; it then becomes the main-stem Willamette, itself a tributary of the mighty Columbia — immense, yet a mere shadow of its glacial ancestor, which carved the Columbia gorge over millions of years. Unbeknownst to me as a child, this pathway, this web of unidirectional flow, was a source of connection to the life-giving force of Nature: we drank from a well fed by its headwaters; we cooled off in its pools and eddies; we fished for rainbow trout and cutthroat trout in secret pools only we thought we knew; we caught and released rough-skinned newts; we were lulled to sleep by the cacophony of frogs and crickets; and we ruminated on the rage and awesome power of its high winter flows. I wouldn’t trade that for anything. At the time, I didn’t know where rivers went; in my mind, they simply cut through various locations, and for all I knew, they flowed uphill, or over hill. I did not know, then, their ultimate destination: the ocean. As the years went on, I yearned to return to this one river, much as the anadromous salmonid’s environmental and genetic imprint propels them to return to their natal stream. As the salmon feeds and grows and changes, so too did I grow and learn and alter my worldview. Yet, I, too, for no particular reason, felt impelled to come back. Perhaps it was some aerial concoction of moss and Pennyroyal; of Nettle and blackberry, swirling in my recollection, desiring to be relived and recaptured; perhaps it was the need to retread those paths of my youth long relegated to memory, to see which elements had remained static and which had changed, or disappeared entirely. But, whatever it was, I chose the act of fishing along this river as the vehicle through which to reexamine life and nature. It wasn’t a conscious choice, but merely the way it worked out. The fishing we grew up with was not fly-fishing, though I greatly admire its artful style and hope to delve into it more someday; it was not bobber-fishing, or lake fishing, or ocean fishing, each with its various particularities. No, we learned a little differently. My siblings and I were shown the way of drift-fishing: casting and drifting bait close to the bottom of the river, among other techniques. We often caught the bait ourselves, such as worms, crickets, grasshoppers and hellgrammites — whatever happened to be hatching or whizzing around during the season. Now, of course, this resembles the technique of “matching the hatch,” used in fly-fishing, with the main difference being that drift-fishing contains the act of first pursuing an insect, then utilizing that insect to catch a fish. This active process, of “inserting” oneself into the cycle of life, was humbling and validating. The simple act of catching insects; presenting them “naturally;” hopefully netting a fish; and finally, consuming the fish itself, was like a microcosm of the ever-recycling closed system that is Earth. As I aged, my wish to see our rivers preserved increased. 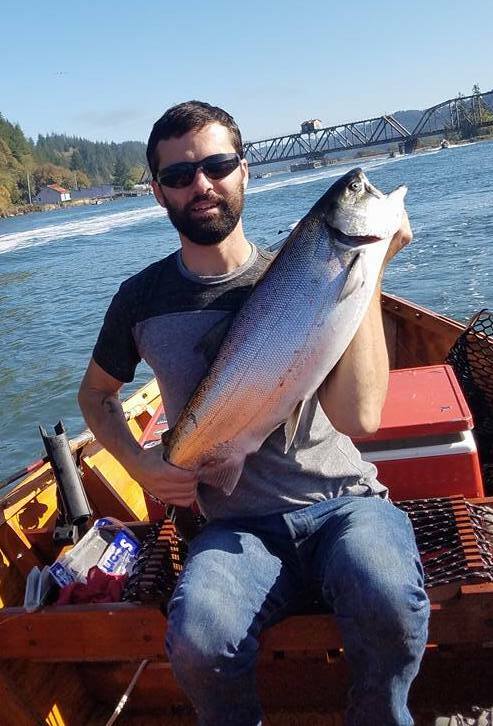 I became grateful for things like fish ladders, conservation easements, tree-planting, riparian restoration, catch limits, and clean-up efforts — anything that would allow more people to respectfully enjoy nature’s bounty. And so, I have come to think of myself as someone who looks to a world before civilization for a more “civilized” approach to stewardship. What were environments (and specifically, waterways) like before we attempted to control them – to divert, dam, redistribute and “manage” them? Therein, to me, lies part of the solution: to return our waterways back to some semblance of their former selves. Or, at least, to balance our needs and desires with that of the environment. It’s all easier said than done. But, that is the hope, and it has informed much of the creative process of Merry Gamesters’ first table-top game, Reel Me In. 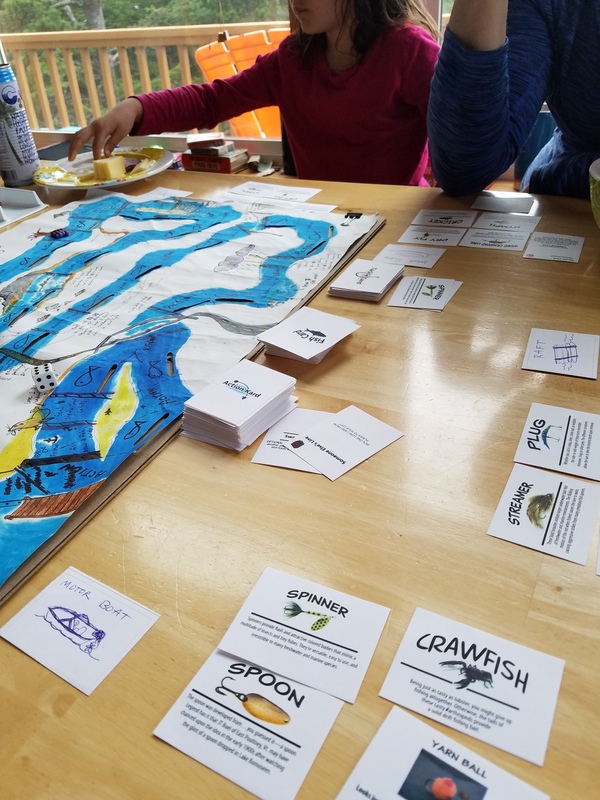 What better way to implement and raise awareness of the importance of our waterways and the environment than through gaming? Why can’t it be fun? We, through our first game, are seeking an inclusive path forward, one where we can all enjoy protecting and preserving our heritage – a process in which conserving the resources around us is not a blame game, but a progressive game. 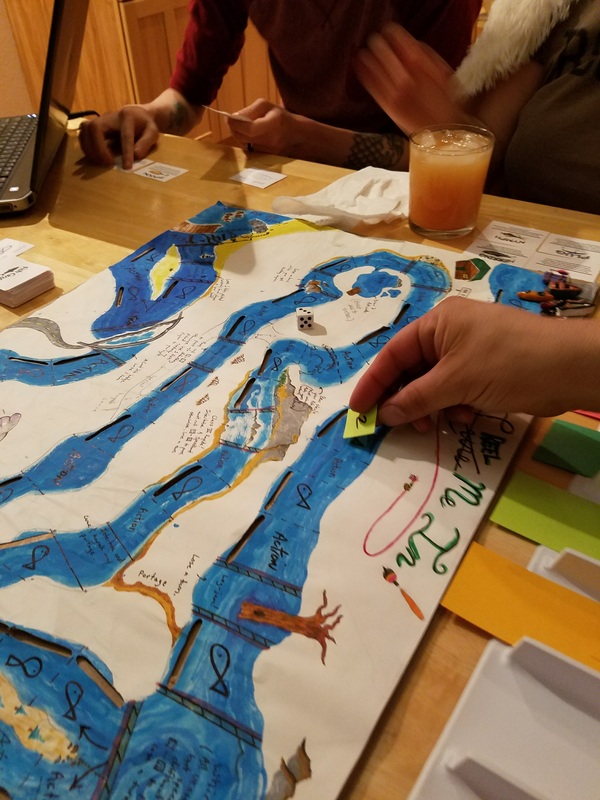 It is fun and exciting to enjoy a night playing with friends and family, while also knowing you’re raising awareness about the challenges and benefits of preserving streams and habitats. Through the “karma cards,” as well as some of the action cards, it was my hope to provide fishing information, biology facts, boater safety, and conservation techniques. These cards are mixed into the action card deck and provide little surprises along the way, while also teaching, or expanding upon gamers’ knowledge of fishing. These cards add value to your final “cooler” total at the end of the game and thus incentivize the process of conservation and safety, which are just one of the myriad ways that Reel Me In sets itself apart from the few fishing games on the market. Likewise, the fish card deck is chock-full of all your favorite fish species, from rainbow trout to Chinook salmon, from green and white sturgeon to the ever elusive summer steelhead. Not only do these cards count for various values depending upon the difficulty of catching them and/or the value placed upon them by fishermen; but, they also contain snippets of biological information, habitat history, techniques for catching, witty quips, etc. The original artwork and graphic design pay tribute to these magnificent creatures, as well as offer a splendor to the overall aesthetic of the game. All these elements and more converge to create a game both fun and relevant, educational and progressive and that is why I believe in this project. 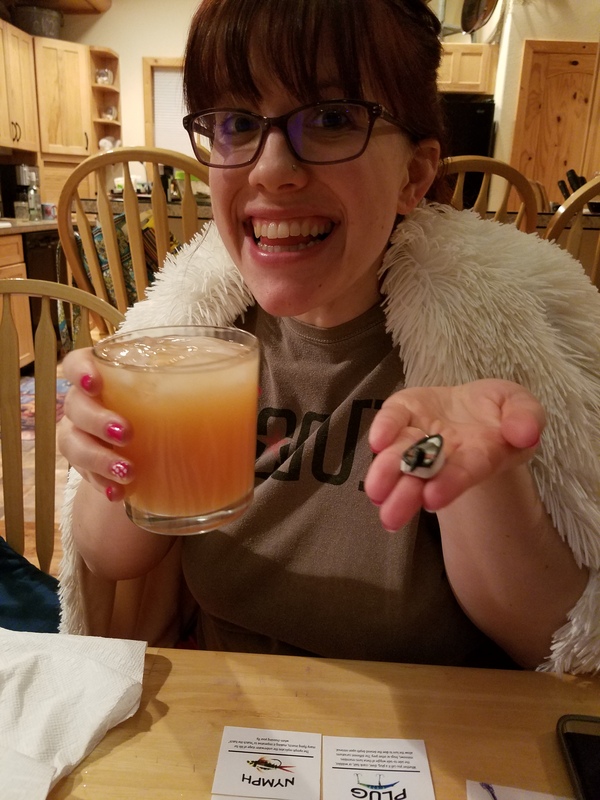 It seeks, as hopefully all Merry Gamesters’ projects will, to go beyond the table, and out into the wider world and that is just one reason why I can’t wait for you, too, to engage in this process with us. I’m curious what stream is important to you? What beach? What habitat? What waterway do you wish was protected better? And what do you think of the idea of blending gaming and fishing? I’d love to hear all about it. *If you wish to stay apprised of updates and our ultimate Kickstarter launch date, please feel free to sign up for our email list at the top-right of the page, or follow along on our Facebook page at Merry Gamesters. This is so eloquent. You really captured the wonder of what it was like to grow up on a river. Well said and well played my brother.